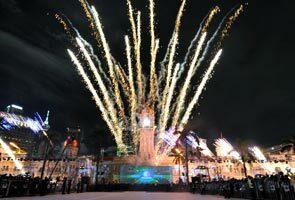 KUALA LUMPUR: The launch of Visit Malaysia Year (VMY) 2014 at Dataran Merdeka tonight was done in all its colour and splendour in the presence of domestic and foreign tourists. A drizzle did not dampen the spriit of the audience who were entertained with cultural performances including by Datuk Siti Nurhaliza who sang the theme song 'Cuti-Cuti Malaysia'. VMY 2014 was launched by Deputy Prime Minister Tan Sri Muhyiddin Yassin, who was present with his wife, Puan Sri Noorainee Abdul Rahman. Also present were Tourism and Culture Minister Datuk Seri Nazri Aziz, Kuala Lumpur Mayor Datuk Seri Ahmad Phesal Talib, guests and dignitaries. Besides a fireworks display, the audience were shown a montage of interesting places to visit in the country. Various programmes were organised including video games, 6D van simulation and food stalls serving traditional food from 14 states. VMY 2014 with the theme "Celebrating 1Malaysia Truly Asia' is held for the fourth time. VMY was first organised in 1990. Earlier, Nazri said over 600 international tour packages and 1,001 domestic tour packages were created and over 200 major events were prepared for VMY 2014. "From the depths of our seas and magnificent coast to the heights of our mountain ranges, mega bio-diversities and 130 million year old rainforests, we have formulated something for everyone to enjoy. "We have also covered all bases to ensure that there will always be something that caters to their needs and preferences in line with our brand of Malaysia Truly Asia." The awaited event would also showcase the proboscis monkey as official mascot to raise awareness on the importance of wildlife and nature conservation besides instilling interest among tourists towards the national tourism asset. Nazri said the ministry also introduced the 'We Are The Host' campaign to boost everyone's spirit and role to being a great host. The letter H refers to the Heart which implies the care for tourists to bring home pleasant memories, O for Open to welcome tourists with open arms, S for Smile and T for Together. A special concert by Malaysian artistes was also held to end tonight's ceremony which was attended by about 50,000 visitors.